This cocktail is just as delicious as it looks and is perfect to start your pre-Valentine weekend with. To make strawberry hearts for the garnish, cut a small “v” to remove the stem of the strawberry, then cut into slices. For the rim of the glass, simply make a cut halfway up the bottom of a strawberry. To rim the martini glass with sugar, run a lime wedge along the rim of the glass to get it wet and dip the glass in a plate with sugar. The drink is already sweet, but this looks good. In a shaker filled with ice, mix the rum, schnapps, vodka and cranberry juice together, shake gently and then pour into the prepared glass. 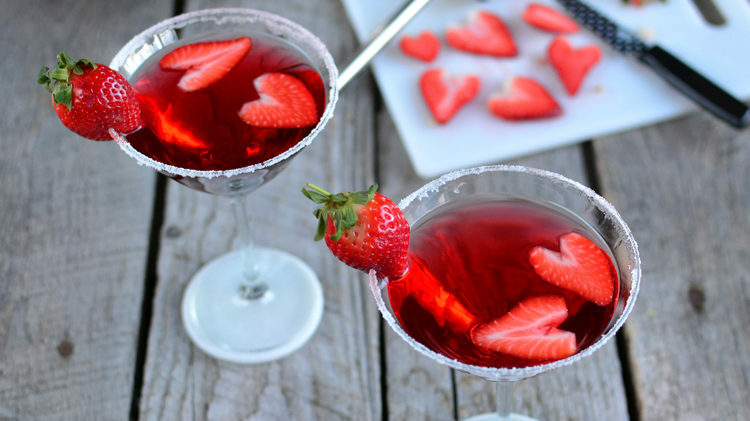 Garnish your love martini with strawberry hearts and a strawberry on the rim.